According to Wikipedia, Definition of Man, also known as the Definition of Human, originated from a summary essay of Kenneth Burke (1897–1993) which he included in his 1966 work, Language as Symbolic Action. His definition of man states: “Man is the symbol-using (symbol-making, symbol-misusing) animal, inventor of the negative (or moralized by the negative), separated from his natural condition by instruments of his own making, goaded by the spirit of hierarchy (or moved by the sense of order), and rotten with perfection”. Definition of Man playwright Nikki Muller begins her exploration with Burke’s words. And it is important to note the profundity of the ideas presented. Muller’s seamless organization of Burke’s concepts are spectacular. The play, however, is fully and firmly her own. This past Sunday was a spontaneous revisit of Definition of Man. Summer 2018 marked my first experience with this play at Scotland’s prestigious Edinburgh Fringe Festival ( It also won Best in Dance and Physical Theatre at the 2017 Hollywood Fringe) where the production made so much more than a mere impression. It got highly personal. 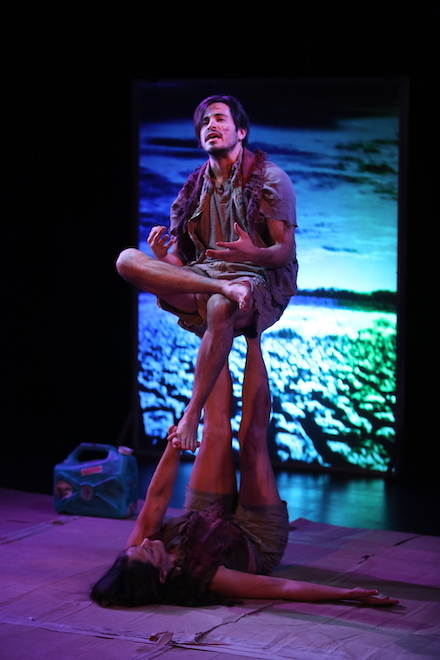 Written by Nikki Muller and performed by both Nikki and co-creator Jason Rosario, Definition of Man is all the things one longs to say but doesn’t have the courage to openly express. There is so much in the writing that hearing the ideas set inside the play is both thrilling and terrifying. Each word is the next step in a maze, a web of thoughts compelled to the surface and forced into sounds, not merely for the sake of saying them aloud. Language is the modem of survival. Then there is the stillness of the piece. Even in all the facets of movement and dialog it captivates the mind, pulls at the heart, elevates the human spirit and desecrates everything that human beings cling to for meaning. Definition of Man does nothing to ‘transport’ the audience anywhere beyond their seats. Instead, you are definitively held in the present moment. The imprimatur of its rawness is weighty and solemn. At times angry and violent. Then soft and longing. Always uncomfortable. Explicitly intimate. It’s beginning ambiguous. It’s conclusion hopeful. All of it, entirely wonderful. Afraid to live. Afraid to die. Desperate to speak. Aching to withhold. The longing fluidity of the discourse flows through the in-between – life, death, love, hate, despair, joy, action, apathy, with words, and without. 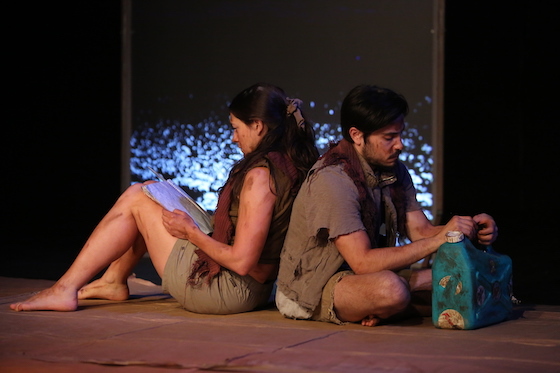 A post-apocalyptic de-creationist, meta-narrative of the last two remaining humans, living in a ruined world, the play lives up to its intent to explore universal themes of identity, gender, race, vulnerability and the impossibility of communication. Ultimately, for these two people, it is when they stop talking and just ‘be’, that they finally understand each other. For us, the silence is when life and humanity happen. Created by Jason Rosario and Nikki Muller. Written by Nikki Muller. Produced by DConstruction Arts. Boldly directed by JJ Mayes and Tavi Stutz. Choreographed by Tavi Stutz. Accompanied by gorgeous background music composition throughout. Definition of Man is a powerful spectacle of human nature. Also: Nikki Muller and Jason Rosario, the show’s co-stars and creators are teaming up with local ASL interpreters David Hernandez and Brianna Barber for their performances on Friday, January 18 at 7PM and Friday, January 25 at 7PM.